Dashing and dangerous Andre Raveneau is the Revolutionary War's most reckless privateer captain when Devon Lindsay stows away aboard his ship after her Connecticut town has been burned by the British. Raveneau sardonically agrees to deliver her to her childhood sweetheart in Virginia but doesn't count on his own potent attraction to the enchanting, courageous Devon. Through high adventure, swashbuckling sea battles, and the colorful history of America's revolution, the couple battles the fiery passion that binds them together. This historical is full of drama, history, spies, pirates, war and some hotness. Andre will be haunting my dreams for awhile. 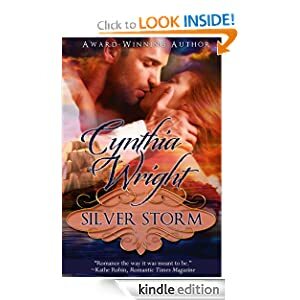 Who wouldn't love a woman stowing away on a privateer ship, falling for a French pirate, escaping war and oh so much more? This book is well written, and Devon is not your usual simpering, fainting female. She's strong, stubborn and strong. I can't wait to read the rest of this series. I know if you pick it up, you'll be as hooked as I am!